Discussion in 'Leaguegaming vs (LGvs)' started by Tris10, Apr 25, 2018. Poll closed May 2, 2018. Honest question, could there be a write-in for 6s? I feel like there is a want throughout the community, even though it's "dead" in the eyes of a lot of people too. Everyone knows the game is broken, but wouldn't the best way to revitalize the competitive 6s community be to have more events for it? Just thought I'd see what others think, because I personally have never touched HUT, and almost never 1v1 people (granted I'm a goalie). I'm just thinking that having 6s events would garner more interest and popularity for it. 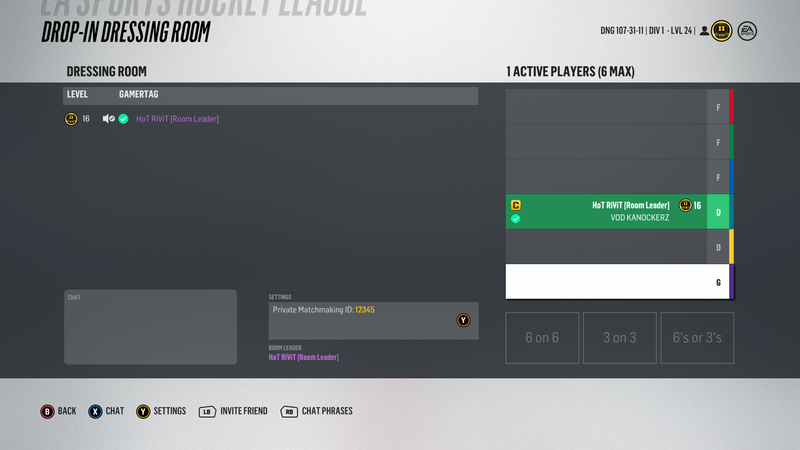 Just a question, I prefer to play goalie and is it possible to get a version where goalies can put there hut/nhl team against other goalies. Maybe make two separate ones. What about a pay 3+G league event? $20 buyin ($5 per)? Why not in drop-in? Just use private matchmaking pin? Wouldn't just simple screenshots suffice? It's a money tourney. Just need to know the winning team. NHL teams with no buy-in. Make it more accessible to more people before adding more buy-in events. I don't feel the previously free versus event was given enough exposure due to it being so close to the World Gaming Championships. If you make it free, you open the door for more users to come to LeagueGaming. Establish a large base of users playing - and then start running leagues in parallel to the free league to give people the option of buying in to participate. What about NHL threes. 2 Skaters and a locked Goalie. I'd like the buy-in events to continue. The competition is what I care about most when playing here which is why I probably wouldn't participate in a free event. However that seems to be what the majority wants. One thing I'd like to say, and maybe I'll ask around to see if there's interest, is a 31 team fantasy draft league with a $25-$50 buy-in. CKxWhalefan26 Bring the Whalers Home! If free versus rounds run again, I would like to see a rule regarding people who play 0-4 games to have to play more than that or be punished for it. In my eyes each time I choose to play these tournaments I see the same people getting in the top spots. Obviously I'm not the best but I also do want to play people that are at my competitive level on this part of the site. There is FNP on Friday that's competitive. There's sometimes people looking for 6s in the shoutbox. There's clubs on xbox to look for 6s. Meet people from playing on the site and in league games. There are drop in games. Meet friends of friends for 6s ETC. We like the versus play. Just maybe be able to challenge someone would be cool just like the LGHUT we used to have. That would be awesome. Would be very tough to get 31 people to commit though.